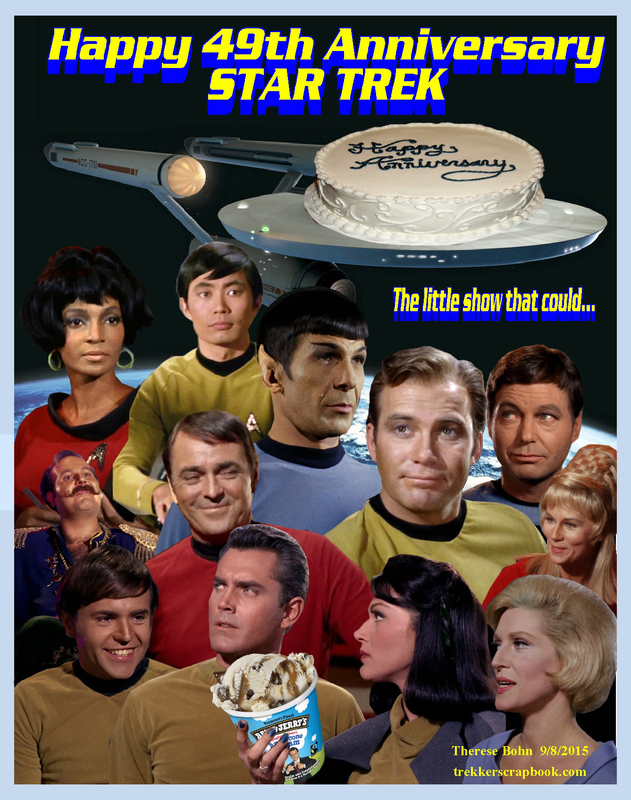 Happy 51st Anniversary to Star Trek TOS! Today should always be a holiday for Trek fans everywhere! On this day, September 8, 1966, Star Trek premiered on NBC. I doubt anyone then thought it would become a milestone in modern science fiction, and glancing at some of these reviews you could see a sense of doubt. But aren’t we lucky that it got on the air after all? To my knowledge, Star Trek was the only network TV series that got two pilots made! Unfortunately, the original episodes were not shown in shooting order, but rather the first episode the network preferred, which was The Man Trap. (even the artwork for its premiere featured Where No Man has Gone Before!). Man Trap was a good episode, but not the best offering for a show that was attempting to be seen as serious. 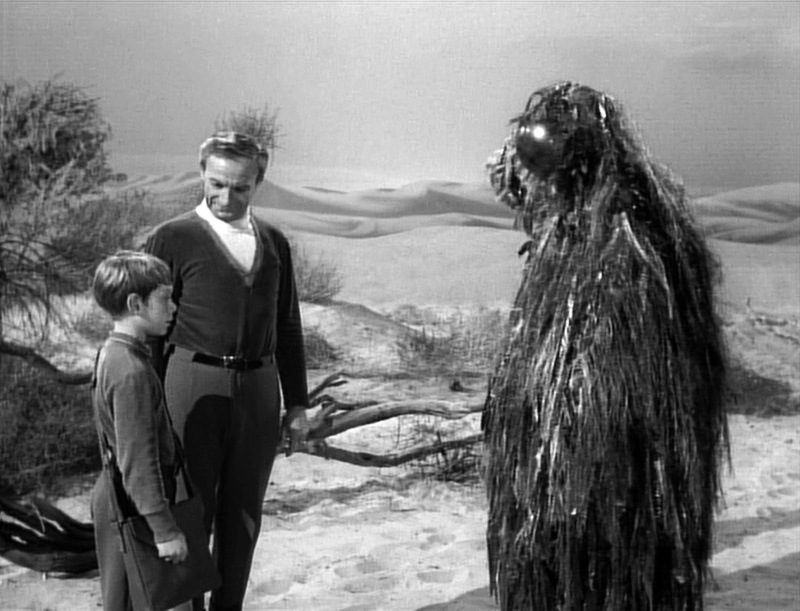 Although the Salt Vampire was seen sympathetically, she was still, alas, a monster, and some early critics saw little potential beyond that, probably laughing it off as another kiddie sci-fi like Lost in Space. Bit other critics saw potential, and I think if the original Trek wasn’t shoehorned into a cemetery-shift time-slot by its 3rd and final season, it might have made it to a full 5-year journey. There’s a part of me that would have loved to see the original Trek progress into 5 seasons (up to 1971) but somehow, I think without Roddenberry as the main producer (Fred Freiberger took over in season 3) I suspect it may have gotten worse. Freiberber preferred action over deeper philosophical themes. 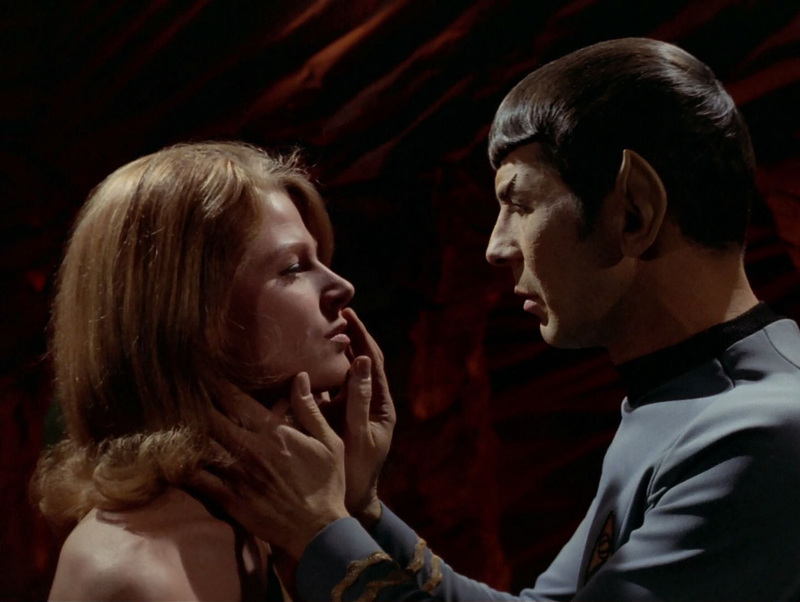 In a way, we were lucky it ended in 1969, for I doubt it would become the timeless phenomenon it became in the decade long gap between TOS and the first movie. I interrupt my hiatus yet again to remind you all that today is a special anniversary! 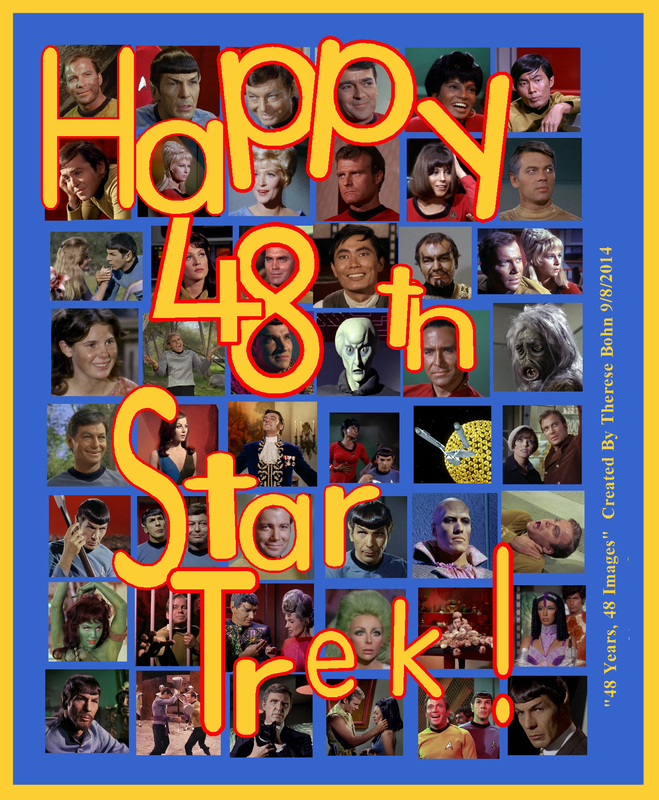 Happy 49th Star Trek! You have truly lived Long and Prospered! Happy 48th Anniversary to Our Favorite little Space Opera! 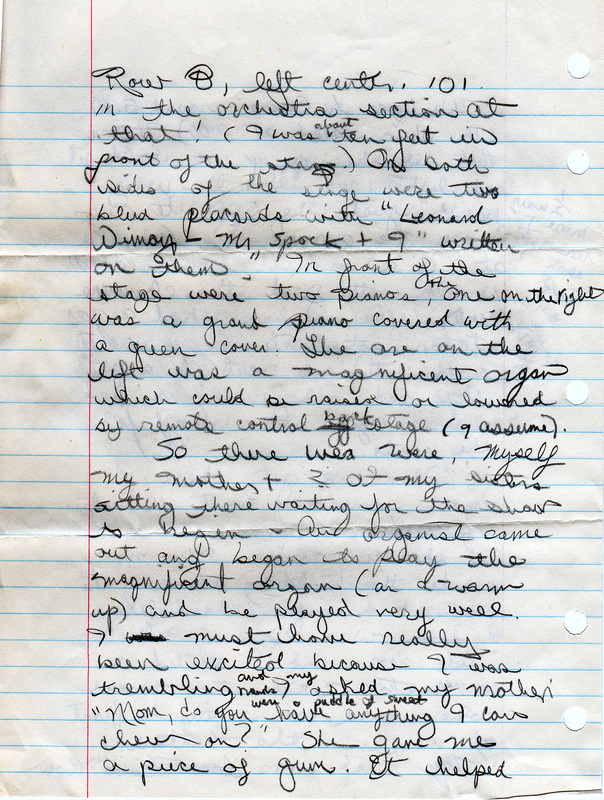 One of the eight pages I scribbled after our night with Nimoy! 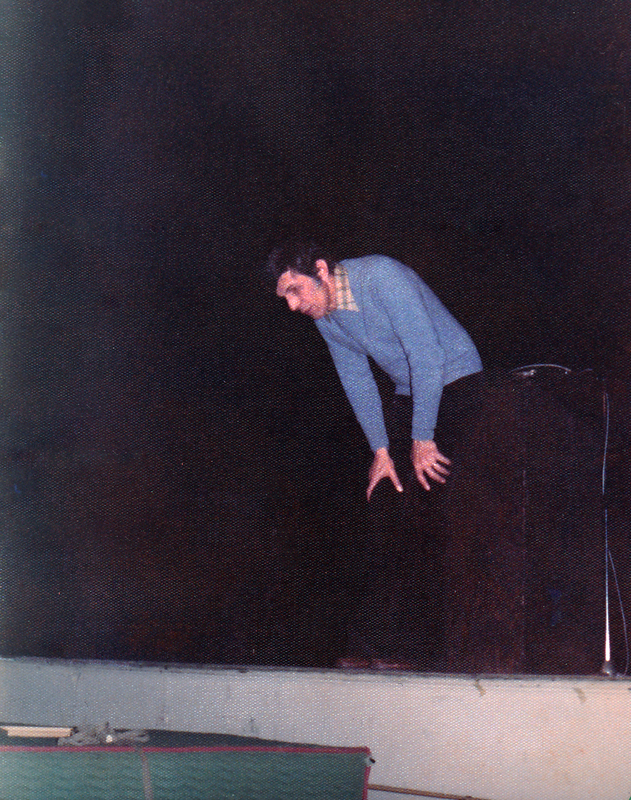 sauntered across the stage in a pale blue sweater, beige and grey plaid shirt and brown trousers. The audience erupted in whoops, hollers, and Vulcan salutes, I could feel my face grow warm with excitement as I saluted too. 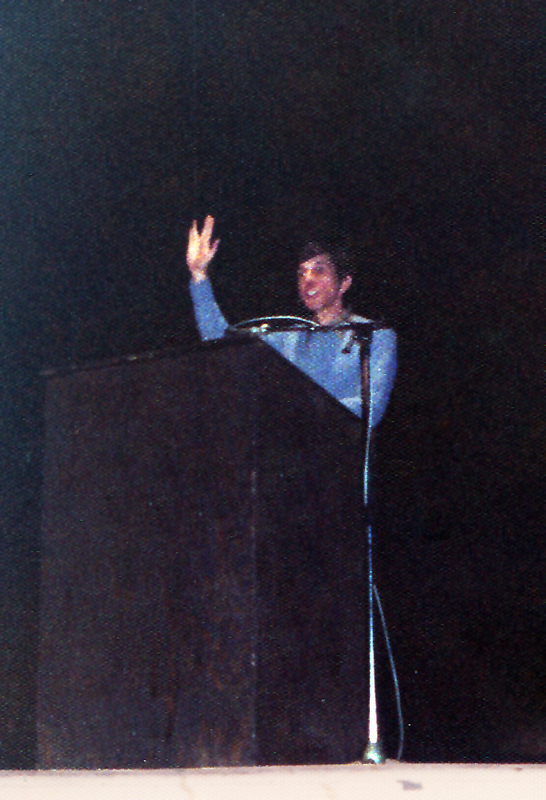 Nimoy began with a cheeky ice-breaker: “You are an emotional bunch of humans!” he grinned. And for the next two hours with just a pitcher of water for the occasional sip, he regaled us with funny and thoughtful tales of about life as an actor, as Mr. Spock, and little philosophies about life, the universe, and everything. At the end I recall he even recited a poem (his?) with its refrain “Hallelujah”, and everyone in the audience saying it along with him in a wonderful moment of communion. One of the funniest stories he related was how, one day while filming on the Star Trek set he had an awful toothache; so awful in fact that on his lunch break he went straight to the dentist in full costume, ears, uniform and all! He recalled getting plenty of odd looks while driving across L.A. to the dentist, yet at the office, throughout the entire check-up, neither the receptionist nor the dentist uttered a word about his other-worldly appearance. “Could you imagine what they said after I left ?” he joked. And then it was time for questions. My hand shot up and I was the first one he called on. In anticipation of this evening, I had created a gift for him. I had been practicing my calligraphy for my 10th grade advertising class and I had painstakingly recreated on parchment in pen and ink with the prettiest font I could muster, a quote from his recent biography I Am Not Spock. The quote read something like: ‘We spend so much time doing what me must do, that we forget what we can do.” and was bordered in a simple pine frame. I nervously said “Mr. Nimoy, I made this for you in honor of your upcoming (wedding) anniversary.” and I reached over the brass railing that separated us from the stage, and pushed the frame as far forward onto the grand piano in front of the stage as I could. Mr. Nimoy comes out from behind the podium at the Clemens Center in Elmira NY, and reads the calligraphy gift from Therese on the piano. 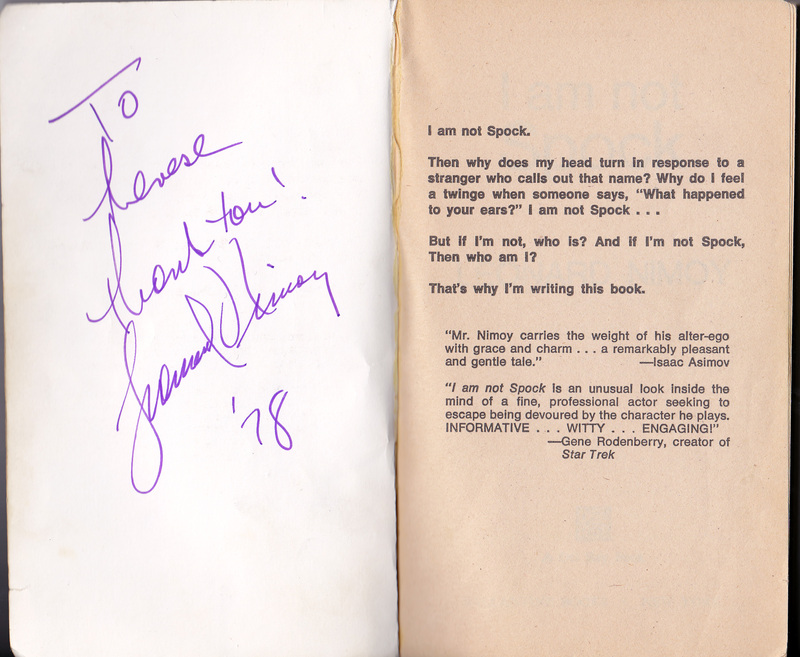 “Hi Mister Nimoy.” and I put forward the gift. “Ah yes!” he replied “Thank you very much, it’s is really beautiful! I told him (again) it was was in honor of his upcoming wedding anniversary, and he replied “Yes, it’s in four days!” Then looking at the writing on the piece he asked “Are you into calligraphy?” And without thinking I said “No, but I’m taking Advertising in school!” (I felt really stupid after saying that, since my gift to him WAS a piece of calligraphy, I just couldn’t put two and two together!) He sat at the dressing table and gestured for me to sit at the other chair there, and as I did, he noticed the three LNAF membership cards I had pinned to my blouse. The three LNAF cards I had pinned to my blouse that exciting night. 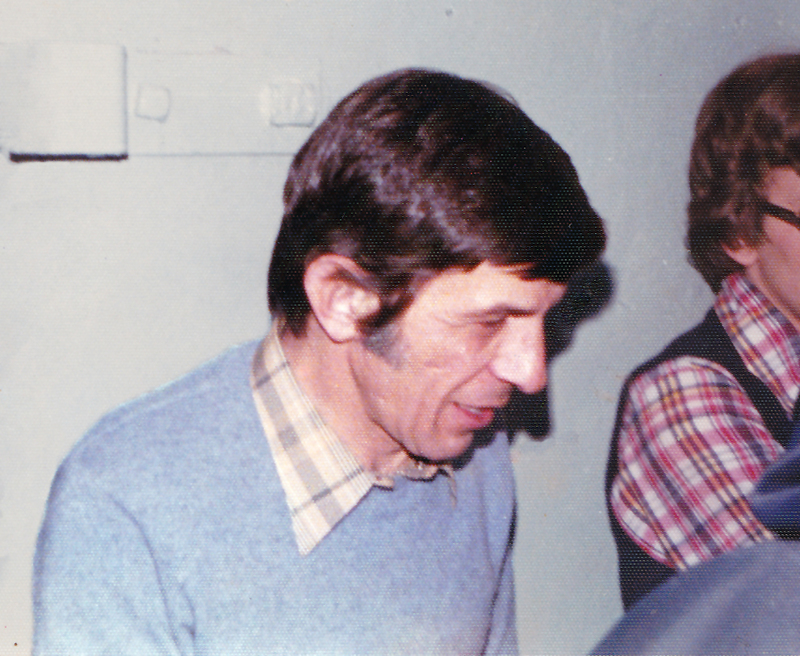 Photo of Leonard Nimoy after his Clemens Center lecture, taken by fan Linda Jessup , who sent me these three Nimoy pictures the following month. I am forever grateful. Okay, writing this post has reduced me to a pile of jello. 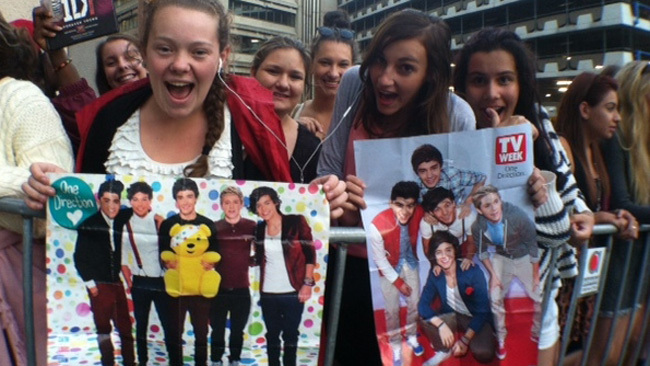 Clean up in aisle 12 please! Thanks Mr. Nimoy, and if I ever meet you again, I’ll bring my camera! 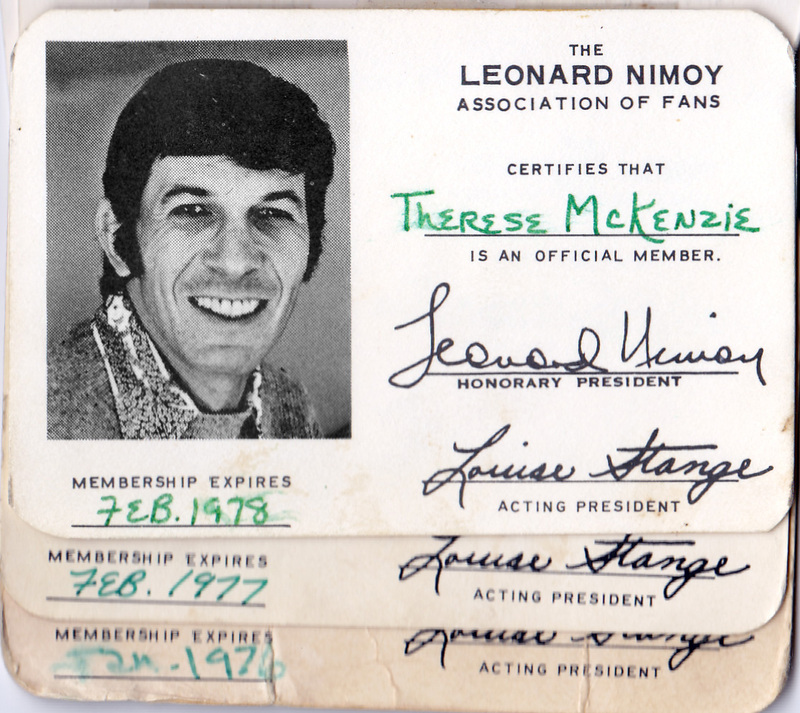 *Louise Stange, the president of the Leonard Nimoy Association of Fans (LNAF) in Ohio.